2013 ART ON ICE: King Richard Brodeur is back in goal! The annual “Art on Ice” Show will be in full action starting this weekend with new paintings by hockey legend, King Richard Brodeur. 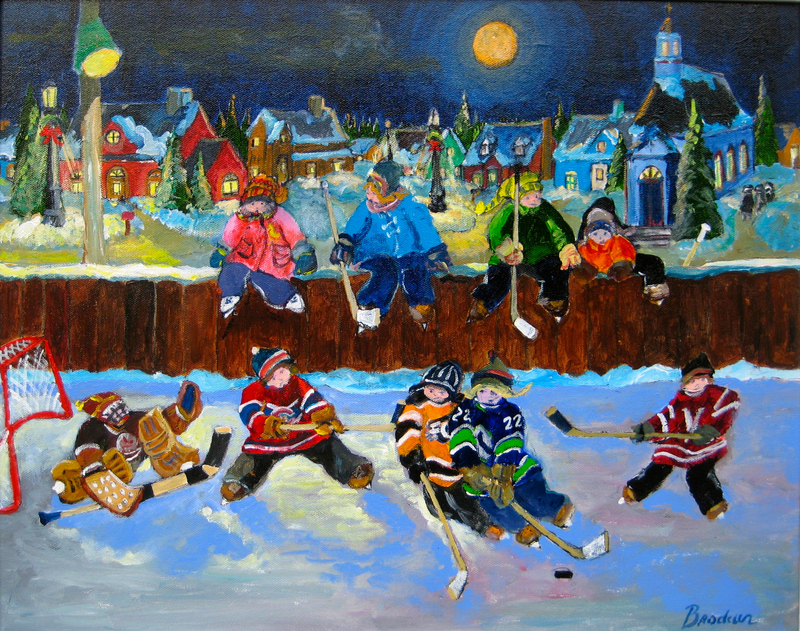 Inspired by his childhood memories of backyard hockey, he couldn’t resist putting himself back in goal for his painting, “Into the Night”. The show opens Saturday March 23 at the Birthplace of B.C. Gallery in Fort Langley. Visit with King Richard on Saturday or Sunday (Noon to 4 pm). The show continues to April 10, 2013. This entry was posted in At the Gallery - NOW SHOWING, Gallery Artists in the news, King Richard Brodeur, The Art of Sports. Bookmark the permalink.